The Spirit drafted Meggie Dougherty Howard with the No. 29 overall pick in the 2017 NWSL College Draft. 2018: Played in 23 games for the Spirit, including 14 starts, totaling 1,448 minutes played. Dougherty Howard completed her passes at a 76.7% rate, completing 704 on the season. In addition, she made 11 key passes and 22 interceptions. 2017: During her rookie campaign, Dougherty Howard played in 23 of Washington’s 24 regular season games, totaling 1,911 minutes of playing time. She scored one goal and notched one assist while leading the team with 858 total passes. 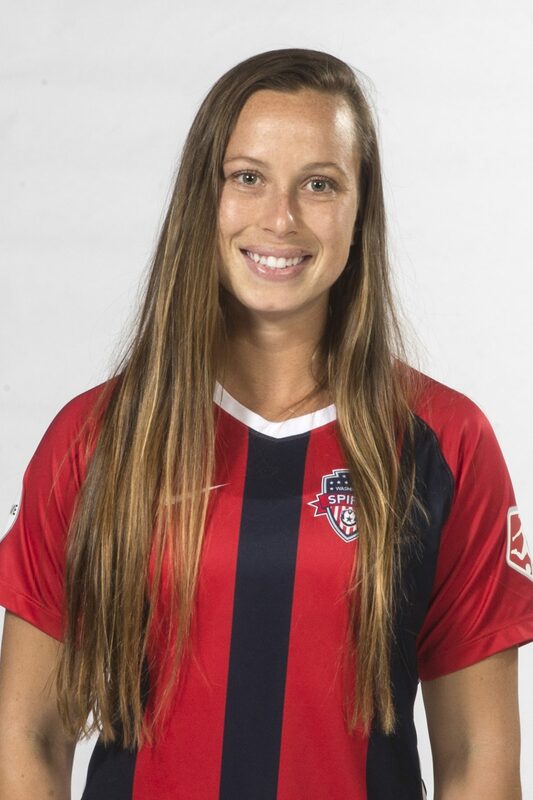 She played on the Washington Spirit Reserves team in 2015 and 2016 which won the USL W-League Championship in 2015 and the Women’s Premier Soccer League (WPSL) East title in 2016. Dougherty Howard shared the Washington Spirit Reserves goals lead (5) in 2016 and was named to the USL W-League All-League team in 2015. Attended U.S. Under-23 National Team camps in May 2016 and January 2017…Part of U.S. U-23 team in Nordic Tournament in England in 2016, starting first and final matches…Attended the U.S. Under 15 Girls’ National Team camp in Carson, Calif. at the U.S. Soccer Federation National Training Center in November of 2011. 2016: National Soccer Coaches Association of America (NSCAA) All-America third-team…NSCAA All-South Region and All-Southeastern Conference first team…SEC Tournament Most Valuable Player after registering an assist in each tournament match, including on golden goal in final…Also recorded an assist or goal (or both) in each NCAA Tournament match…Started every match at defensive midfield…Led Gators with 12 assists, second in points (28) and tied for second in goals (8) – all collegiate highs…NSCAA Scholar All-America first team…2015: National Soccer Coaches Association of America (NSCAA) All-South Region second team…All-SEC second team at midfield….All-SEC Tournament selection…Appeared in every match with 23 starts, playing the entirety of 11 matches…Member of SEC Academic Honor Roll. 2014: Started every match at defensive midfield, playing the entirety of seven matches… Member of SEC Academic Honor Roll. 2013: Appeared in every match, starting the last 20 at holding midfield.